BANKIE FORSTER BANKIE 1946-2017 Tribute from Family Home and Abroad, Remains in our AUSC in Memory, November 21st, 2017,Kigali-Rwanda. As family members, we all mourn the loss of Bankie, each of us in our different ways, with treasured personal memories. Whether remembering him as a responsible big brother – who was steadfast, principled and no-nonsense in everything he set out to do, exceptionally dutiful about never forgetting anniversaries or birthdays or as an inspiring cousin, we attest to the fact that Bankie always was true to his convictions, particularly as a committed pan-Africanist sworn to the tenets of that philosophy, which led to his choice to live in Southern Africa. Bankie had an attitude to life that, to some of us younger than him, seemed almost austere. This impression may have been borne out of the fact that he was, in everyday company, a generally reserved gentleman, and one of few words. However, in truth, not far beneath that serious exterior was a quirky sense of humour, coupled with a fair amount of curiosity and amusement about ordinary subjects such asthe goings-on in town. So it was not unusual to find that Bankie would intersperse conversation- even during serious intellectual encounters – with a surprisingly amusing observation or even a patently risque quip that could be quite startling in itself! Some of us family were particularly privileged to share and be introduced to his mixed network of friends and associates. Whether it was the funky, Chelsea-booted crowd rocking through the Swinging Sixties, or friends who shared his passion for afro-centric genres such as Osibisa, Fela and the disco scene of the 1970s, or those who transited with him into the perhaps more sober, socio-politically conscious era of the 1980s, 90s and, more latterly, this 21st century, many are the rewarding and lasting relationships that were earned through our association with Bankie, which we carried on into our older and retiring years. In his public persona Bankies global and diasporic concerns were well known, acknowledged and respected. There were other more complex and intimate facets to his character that went beyond the obviously political matters on which he was such an effective writer and activist, embracing Black culture in its widest manifestations film, music, language, literature all concerned and interested him and he generously shared his canny observations and insights, typically in regular emails with informative attachments. And it was always a pleasant surprise to receive in the post a package, addressed in his distinctive handwriting, containing another conscious book that he had written, contributed to or published. In these ways and more, we were and continue to be enriched as Bankies fortunate family. The tangible legacy Bankie leaves is enormous: his spirit lives on in his son Kojo Hlalele Forster, and in his work, his commitments, his associations and, not least, his loyal circle of friends such as Ladi, and others gathered here today – all are precious remnants of Bankie and of our time with him. We remember him with love and fondness. We will miss him. Dear Bankie, rest in peace. Very sadly our friend and colleague, Mr. Bankie F. Bankie, has passed on. It is taking some time to piece together all the rather patchy information on the circumstances surrounding his demise. I have been in touch with his wife, friends and colleagues in Namibia since the morning of the 6th August when the first news reached me from his sister in Ghana. We have set up a working group in Namibia, which is making all the necessary preparations for his funeral. His request, according to his will, is that he wanted to be cremated. The date for the cremation has not been fixed. I spoke yesterday to the former Prime Minister of Namibia, Mr. NahasAngula, who is the most senior person involved in the preparations for his funeral. The Namibian authorities and colleagues have done a splendid job on announcements in the country. Mrs. Rita Bankie discovered Bankies decomposing body when she arrived from travels on the evening of Tuesday, 1st August. I was called by Estelle Appiah, Bankies sister on Sunday morning at 1 AM, who informed me that she had received news of her brothers death and whether I could confirm the sad news. Early in the morning of Sunday, I made contact with two colleagues in Namibia who, after investigations, confirmed the news. Apparently, his body was decomposed. Mrs. Estelle Appiah, Bankies sister, has asked for official reports and a death certificate through the Ghana High Commission in Namibia so that his will can be formally registered in the High Court in Accra. It is with sad heart that I am sharing the information on the passing on of my mentor, Brother Bankie F. Bankie.One of the sterling advocates of Afrikan unity and solidarity is no more.He joined the ancestors on 06 August 2017 in Windhoek, NAMIBIA.BrotherBankie is originally from Ghana but settled in Namibia since our independence in the 1990s.By googling his name one can surely get some of his writings and teachings on internet.Go well my Mentor, Go well the Great Pan-Afrikanist. Some where in 1982, I met Banki Foster Banki for the first time at the State House (Job 600) in Accra. He was staying in one of the flats. We got on discussing pan Africanism, the struggle against white minority regimes in Southern Africa. He informed us that CaptKojoTsikata was posting him to Luanda, Angola as head of the Ghanaian mission. On and off, I and a few radicals would pass by to discuss our ‘struggle’. He always had some thing new for us by way of reading and information. In exile in London in the 80s, we reconnected through the efforts of Professor Abdulramah Mohamed Babu, a former Tanzania planning minister and the man who introduced Patrice Lumumba to Kwame Nkrumah during the 1958 All African People’s Conference. Babu and Bankie worked to have TajudeenAbdulrahim and my self to move to Uganda to start the process (secretariat) towards the 7th Pan African Congress between 1992 and April 1994 when the Congress was held. I remember in my small office high up the building oppose the British High Commissioner in Kampala Bankie’s telephone calls, his long and short notes providing ‘direction’ and also kicking against those interest groups he thought should not be in the pan African movement. Arab Sudan, Libya and Arab slave raiders were topics dear to him. When Bankie lost debates within the International Preparatory Committee he simply accepted the majority position and returned to his base to fight another time. Some of the challenges during the 7th Congress in Kampala included accepting donations from leaders such as Colonel Gaddafy, Flt Lt. Jerry Rawlings (the NDC contributed $100,000 through Babu) and other regimes. Bankie and few others on the IPC were opposed, but had no actionable options to quote Major General (rtd) KhahindaOtafiire, the Ugandan minister for justice and constitutional affairs. On a very personal note. My first visit to liberated Namibia was in 1992 with my six months old son Sule. Bankie took us around Windhoek and link me up with my comrades ambassador Kamati and permanent secretary to the ministry of employment. He was very busy, but took time off. Bankie was pan African in action. His concerns about Africans in the Pacific including India is worth further attention. In June this year, I had requested Ghana’s High Commissioner to Namibia to check on Banki upon arrival in Windhoek. On the day of her arrival, Bankie was found dead. She cried. The struggle for the unity of the African world continues. One Afrikan love, peace and good vibrations to everyone. My deepest condolences to his family.May his soul rest in peace. This is sad news, may his soul rest in perfect peace. What a shock to hear this sad news, Estelle. Bankie will be much missed. Do accept our profound condolences at the passing of Bankie. May his soul and that of the faithful rest in peace. And may you and the family be comforted by our prayerful thoughts. So sorry to hear this sad news.May his soul rest in peace. Thinking of you Estelle and standing with you in prayer. I am deeply saddened and shocked to hear of Bankie’s passing. We communicated regularly over the years, especially with regard to the tragedy that is South Sudan and his work in building the Sudan Sensitisation Project. More recently, he was preoccupied with the deteriorating relationship between Qatar and the Gulf States. His commitment to building upon the gains and advances won through liberation struggles was an inspiration to PanAfricanists and anti-imperialists everywhere and he was deeply troubled by the betrayal of the people of South Africa. My thoughts and condolences go out to his entire family. I am so sorry to hear of yet another loss in our family. I saw the mail two days ago just couldn’t handle it that night so devastated. energy. We are all shocked to hear the sudden death of our brother. Ive just seen this, and I have tears. Last I heard from him was on December 27th 2016, and the last I saw of him was when he came for Ekows funeral. I do remember seeing him in between or perhaps even after (my mind plays tricks). One event I do remember was when we had dinner with one of his friends from South Sudan here at the Alisa Hotel. I was honoured to meet the gentleman because I had paid little attention to the SS struggle until then. In his own way, Bankie kept us connected to that socio-political consciousness which all too often escapes us. Activist RomonaEpifaniaHidileko, who worked very closely with the late Elder Bankie F. Bankie at the National Youth Council (NYC),delivered the news that our Pan African teacher and guide has departed from this earth. Indeed, he has proceeded into the ancestry from where, as African spirituality guides us, he will be watching over us. With the defeat of African spirituality in the arena of death related metaphysical, there is only one way to react and interpret death; the European missionary interpretation. Thomas Sankara, one of Africas greatest African revolutionaries that lived, helped us to deal with death. Listen to what he guided the people of Burkina Faso, on 19th October 1986, following the death of SamoraMachel, then revolutionary leader of Mozambique; avoid falling into sentimentalism . . . with sentimentalism one cannot understand death. Sentimentalism belongs to the messianic vision of the world, which, since it expects a single man to transform the universe, inspires lamentation, discouragement and despondency as soon as this man disappears. SamoraMachel is dead. His death must serve to enlighten and strengthen us as revolutionaries . . . I ask you to name streets, buildings and so on after SamoraMachel over the whole expanse of our territories, because he deserves it”. Similarly, Elder Bankie is dead. His death must to enlighten and strengthen us as Pan-Africanist. Elder Bankie was a Pan-African activist in his own class. He would not want us, I believe, to fall into sentimentalism. He would want us to dedicate our work to the liberation of the African people; particularly towards black peoples knowledge of self. The best we can do is to recall his ideas, thoughts and principles for reflection and action. It is for us to think about our engagements with him for reflections and safe keeping for he is gone for good into ancestry. Although I understood the struggles of the African people and constantly sought personal development of my objective and subjective consciousness when I left Iipumbu Secondary School for the University of Namibia after 2005, I had not reached a refined understanding and appreciation of Pan-Africanism until I met and had personal relationship with Elder Bankie. He taught me Pan Africanism. I was not alone, we were with many others such as EtunaJakobus Joshua, Shidumifa Lot Ndamanomhata and many others. He had many students under his Pan-African tutelage before us. Many of them hold high positions in society today. The best universal reflection of Elder Bankie, therefore, is that of a Pan-African activist, Pan-Africanist teacher and compass for those of us that got closer to him. It must be clarified that he did not teach us Pan-Africanism in classrooms but through personal, social and political encounters. Mr. Bankie had successfully integrated himself with the youth. His cannibalism and politics aside, Mr. Mandela Kapere assisted a great deal in this integration by finding a place for Mr. Bankie at the NYC. This has been a significant development in Mr. Bankies Pan-Africanist work in Namibia. Mr. Kapere, therefore, played an important role in the work of our teacher with the small circles of Pan African youth. Elder Bankie was an action orientated teacher. He loved us dearly. In 2010, he took me out of the World Youth Festival in Pretoria to meet the freedom fighter of the Sudan Peoples Liberation Movement (SPLM). At that time the people of South Sudan were still fighting for independence from Khartoum. The ANC had given diplomatic status to the SPLM. We had long hours of discussion with Dr. John Gai and Sabir Ibrahim who then ran the office. When South Sudan got independence, he asked me to accompany him to a workshop in Addis Ababa to meet with African Activists including those from the newly independent South Sudan dealing with the questions of the challenges of decolonization. Elder Bankie was passionate about the struggles of the people of South Sudan. He introduced us to the problem Islamization and Arabization of Africa with Sudan being a case study. He often, in private conversations, chastised the SWAPO elites for prioritising how the struggle of Palestine over the struggle of people of South Sudan. He was clear on his mission. This is what he wrote to me while attempting to get me in contact of with Activists in Jamaica; You are the next generation who we expect to bring improvement. I have to assist youa word of counsel, Jamaica is in the US backyard. Unlike Cuba which was able to escape from the backyard, Jamaica opted for mysticism via Rasta. In Jamaica Rasta has to be taken very seriously. He would be the first one to call me to order when I go astray. When I was studying in South Africa, he called me to order as follows; I have just read your The Diaspora What Namibia ? I will look at my material and send you something. Yours was published in New Era on the 4 February 2011. I was disappointed it contained no reference to the Eastern Diaspora in Arabia, Gulf etc where Africans were taken much earlier and in much larger number than via the middle passage. Maybe yours was an oversight. I am obliged to comment that you should be careful not to fall in the trap that others who go abroad, such as [name withheld], find themselves in, of abusing those you left behind. At the moment bad words are circulating about you here. He had the following to say about Pan Africanism in Namibia: In Namibia the Youth are disinterested in Africa and its Diaspora. It will come eventually, but its two to three generations away. PACON failed its mission of disseminating Pan-Africanism. I wanted to resign from its Eminent Board in 2005 but was asked to stay on. Despite many efforts to change its Board, the powers-that-be have insisted on keeping the Board. During the armed phase of the struggle SWAPO was generally felt to lack ideological direction. We are paying the costs of that now. What we must do, as Pan Africanists, is to continue the activism of elder Bankie. I still find it very difficult to comprehend the fact that Bankie F. Bankie is no more with us living in flesh on this earth. There are some people you grow up believing without being aware of it that they are immortal. Once they pass away, things stop from being the same things you used to know; the world stops from being the same world. This is how I am feeling since our brother and friend Glenroy Watson broke out to me the sad news. It is always sad to share these kind of information, especially when it concerns someone who was an activist, warrior, revolutionist, a leader, with the aim to create awareness and consciousness on his people, but also an empowerer for the youth! His undying commitment to Afrikan Youth was unquestionable and a HUGE challenge to “arrogant Pan-Africademics” who like to put youth at the back and reserve front seats for themselves only. To Brother Bankie, young Afrikans belonged in front. Always. Also, his awakened analysis and positioning himself as a recurring alarm-system for Arab-led enslavement, anti-Black terrorism and Arabization was important beyond what many lenient Afrikans could comprehend. Many experienced his “rough” and non-negotiable stubbornness, but if you took time to study where that came from, the source was his impatience with our collective non-progress. Brother Bankie had no time for chatting, chilling and celebrating. His stance was no-rest, no-sleep, no-fear. His passing is a HUGE loss to Afrikan Progress. Warrior Bankie was a Ph”DO” (rather than a PhD….) – an ultra-practical Pan-Afrikanist, having completely internalised the struggle and living an Afrikan urgency day and night. On behalf of eBukhosini Solutions in Johannesburg, myself and all entities I have engaged closely with him through, we want to say RISE IN POWER to our departed Brother, Elder, Father, Friend and Progressive Force. May his spirit continue to live through those of us who are still fearless, faithful and militant in our dedication to AfrikanFreedom. May his Ancestral Soul visit us relentlessly, trouble us, wake us up, challenge us, irritate us and PUSH us as hard as necessary – to continue the work that must be done. By ANY means necessary. The struggle does – INDEED – continue. In life we are bound to encounter hardships interchangeable with pleasure during trying movements we need to have patience and perseverance despite much suffering”. Bro Bankie touched many lives in UK, USA, the Caribbean and of course in Mother Afrika,Ghana, Sudan, South Afrika and more so Namibia. Bro Bankie a true Pan Afrikanist knew the power of Unity when harnessed amongst Afrikans in the diaspora and those on the continent who were serious about their future, rather than just “lip service” so worked tirelessly to bring about this shift in actions. Elders Padmore, Washington, Garvey, Malcolm, Martin, Queen YaaAsantewaa, Queen Nanny, Queen mother Moore, Marley, Brath and many more played a role in the shaping of Bro Bankie…commitment and dedication to duty to aid in the final stake in the heart of colonialism. May the Ankhcestors receive you with a big Cheer for your great works. I am left lonely. Not only was he a fellow Pan Africanist. But he was my Pan Africanist teacher, a close friend, a mentor, an encourager, a senior brother, a man who enlightened my mind on Pan Africanist matters, sentiments and ideologies. It was through MrBankie that I came to understand the linkages / bonds between the black people of Africa and the black people in the diaspora’s. He enlightened my mind on issues of utmost importance and new developments globally. It is thought him that I started to understand the politics of the world and not only of Africa. I knew MrBankie Forster Bankie for almost 15 years. I had an opportunity to have a very sound, healthy, close open relationship with the late. He was not an easy going person. But to some of us who had a close relationship with him, knew how to approached him and maintain the relationship with him. We did a lot together by showing our sympathy and solidarity to other African countries and the love we had for this continent. Allow me once again to express my heartfelt feelings of sincerity and condolences to the widow, Africa and the world on the loss of a pillar of hope, wisdom and knowledge, that tree which given us shadow have fallen. If we are happened to be given an opportunity, we shall speak about that extra – ordinary Pan Africanist. May his souls rest in ever lasting peace.Until we shall meet again. Go well my best friend, that i ever had. Brother McDavid Meroro, Vice President of African Improvement Society. I have met MrBankie many times. His words, deeds and writings go beyond Pan-Africanism as we know it. He is one of the few intellectuals to tackle the attempts of modern day extinction of the African black race South of the Sahel by northern Islamic/Muslim Arabic immigrants! Activist RomonaEpifaniaHidileko, who worked very closely with the late Elder BankieF.Bankie at the National Youth Council (NYC), delivered the news that our Pan African teacher and guide has departed from this earth. Indeed, he has proceeded into the ancestry from where, as African spirituality guides us, he will be watching over us. With the defeat of African spirituality in the arena of death related metaphysical, there is only one way to react and interpret death; the European missionary interpretation. Thomas Sankara, one of Africas greatest African revolutionaries that lived, helped us to deal with death. Listen to what he guided the people of Burkina Faso, on 19th October 1986, following the death of SamoraMachel, then revolutionary leader of Mozambique; avoid falling into sentimentalism . . . with sentimentalism one cannot understand death. Sentimentalism belongs to the messianic vision of the world, which, since it expects a single man to transform the universe, inspires lamentation, discouragement and despondency as soon as this man disappears. SamoraMachel is dead. His death must serve to enlighten and strengthen us as revolutionaries . . . I ask you to name streets, buildings and so on after SamoraMachel over the whole expanse of our territories, because he deserves it. Similarly, Elder Bankie is dead. His death must to enlighten and strengthen us as Pan-Africanist. Elder Bankie was a Pan-African activist in his own class. He would not want us, I believe, to fall into sentimentalism. He would want us to dedicate our work to the liberation of the African people; particularly towards black peoples knowledge of self. He would be the first one to call me to order when I go astray. When I was studying in South Africa, he called me to order as follows; I have just read your The Diaspora What Namibia? I will look at my material and send you something. Yours was published in New Era on the 4 February 2011. I was disappointed it contained no reference to the Eastern Diaspora in Arabia, Gulf etc. where Africans were taken much earlier and in much larger number than via the middle passage. Maybe yours was an oversight. I am obliged to comment that you should be careful not to fall in the trap that others who go abroad, such as [name withheld], find themselves in, of abusing those you left behind. At the moment bad words are circulating about you here. very recently regularly. Just could not believe he left us but he will live on with his pan-African legacy forever and ever with much brotherly missing of our beloved brother Banki. with, once again, our deepest condolences to all of you, our African Family, over there. I hold vivid and – now that Brother Bankie has left us physically – very sad memories of all that we shared together at places like the National Youth Council HQs and the Community Youth Centre in Katatura, during my last visit to Namibia, in 2011. How best could we celebrate and honor Brother Bankie’s life if not by tightening up and strengthening our ranks to continue with the same spirit and legacies of struggle from our departed brother and so many other soldiers of the Cause of Pan-Africanism and African Renaissance? Please keep us informed about funeral and tribute arrangements (my WhatsApp: +221 77 640 5023). I am sure that our Sisters and Brothers in South Africa (Prof. KwesiPrah, VusiGumede, MammoMuchie) and Southern Sudan (e.g. former Minister Peter AdwokNyaba, Amb. John Gai N Yoh) and others, are certainly preparing similar tributes to our fallen hero. It would, therefore, be a good idea to think of making a compilation of all such initiatives and see how to share them as widely as possible, especially with the African youth. Prof Sam Amu Namibia: Mr. Bankie was a rare gem, a man of great statue. A versatile conversationalist eager to share wisdom without prejudice or fear. It is so sad that we mostly realise the importance, contribution and impact someone had in our lives after they are long gone, yet we never really showed that much appreciation nor celebrate their presence while in our midst. He was beyond a wonderful men, humble at heart, I know this because the same day we were introduced by comrade @⁨+264 81 627 9462⁩ he immediately decided to personally drop me at UNAM. Words are too cheap, even myself have failed to demonstrate enough of how much he meant to all of us whom he regarded as family and not just his comrades. His memories is more than a motivation to continue where he has left off. RIP our mentor. This is something our society needs to work. That people need to be given words of thank you and appreciation. He edited a manuscript for a conference outcome of a MIRCO organized workshop. He came to Namibia to help build the country with ideas. He altruistically work for building Pan Africanism as a cornerstone of our policies. He should have been given accolades for the selfless dedication to building a better, stronger, ideologically clear Namibia. He never tired of sharing with me progressive articles even when due to call of work, I was not able to share my views. His demise robs Namibia of a intellectual with a proven track record. He has planted the seeds for a better Africa with many Namibians and we should all be grateful that he made Namibia his chosen place of residence. I am sure his limitless belief in Namibia’s Pan African potential will be embraced by all of us. Rest In Peace Brother Bankie. This is very strange and sad news. Hope they find out what exactly happened. Please keep us posted. I am gutted, lost for words. This is a very sad day. His energy and charm will be missed not only by his family but by the CASAS network members like me. My sincere condolences to his wife and loved ones. We are awaiting further information about his funerals! Thank you very much. This is very sad. For a man like Bankie to pass on this way is disturbing. When I go back to Accra next week I will visit Estelle to show solidarity with her. She must be devastated. As a committed, tireless soldier for our Liberation, I would like to present my sincere condolences ! Greetings and thanks for the update. The info will be shared with Comrades of the African liberation struggle. We, the living must commit to advance the unity phase of the unfinished mission in his honor. Thanks again for connecting. When someone like Bro. Bankie passes on, it is custom for the people whose lives he has touched and who have “shared” him, to present condolences to each other for their passing; whilst mourning him together. I do know for a fact how close Brother Bankie and yourself were, as committed, tireless soldiers of the same Cause of Pan-Africanism and African Renaissance. I would like, therefore, to present my sincere condolences to you in particular. May the soul of our departed brother rest in eternal peace. Amen. It was with great sadness that I learned of M Bankie F. Bankie’s passing; please accept my heartfelt condolences. 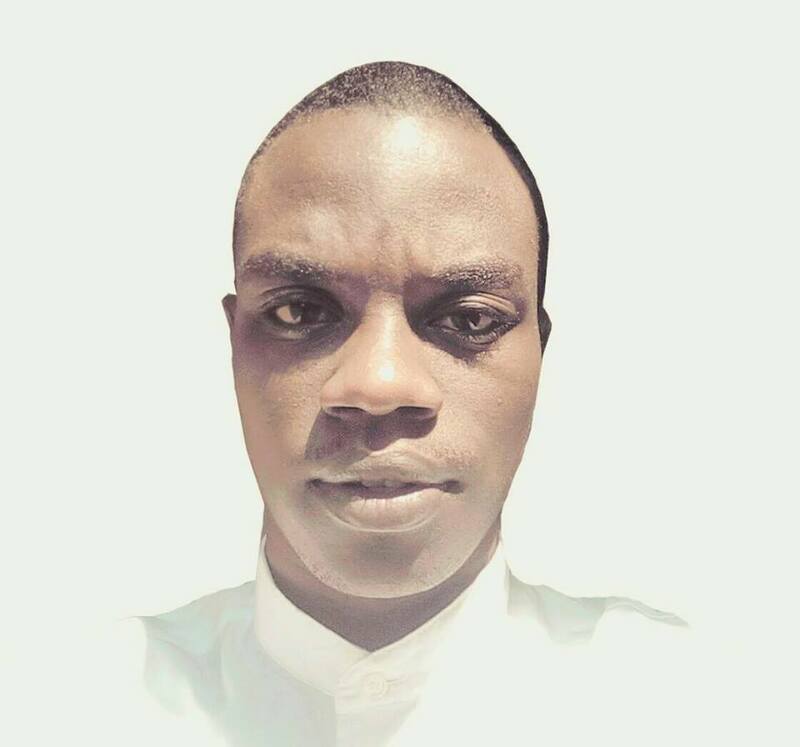 Au nom de Cellule des universitairespanafricanistes de l’UGB de St-Louis du Senegal, nous prsentonsnoscondolances pour la disparition du frre Bankie. Dieusoitsatisfait de lui. PuisseDieuaccder cesvoeux pour la ralisationrapide de notre aspiration. Au nom du CIN/Sngal, nous prsentons la familleplortoutesnoscondolances. Thank you for sharing this very sad news. I am honoured to have known him and shall be forever grateful to Brother Bankie for widening and deepening our lens on the Sudan and strengthening my Pan-African insights and experience. Please convey my deepest sympathy to his family and colleagues. May his work live on and may he rise in perpetual powers. Au nom du CIN-TOGO, nous presentons toutes nos condoleances la famille de l’illustre disparu frere Bankie F. Bankie qui nous a quitte. Qu’il repose en paix. A very sad and devastating news. I remember him so well in 2003 when we were all gathered in Johannesburg. May his soul rest in peace. Our sympathy goes to the family and friends including you of course. Que Dieuaie son meet que la terreluisoitlgre! A really sad end indeed. I didn’t know how to take it when I read Shipolulu’s posting of a tribute in my mail Saturday afternoon. I was simply numbed. I called Kwame later but he had not heard and said he would be contacting you for confirmation. And to think that this is how he passed away.Tragic. Do keep us posted back home. Thank you for this information and my condolences to you and Bankie’s family. It is with great sadness of the news of the passing of our much loved and respected Pan Afrikan brother warrior. It was through dear brother Bankie that I made my sojourn to Azania for the 8th PAC. I am truly indebted to him and his memory will never fade from my heart and mind. My condolence…and may he walk gallantly into the hands of the ancestors! I was so sad　to　hear the　news. Mr. Bankie has contributed a　great deal to the cause of Pan-Africanism. Please send my regards to　his family. So sad how he passed on but good for closure by all of us who were inspired by him if we know for sure what happened…Thank you Prof Prah for following up!! We are many who were and will continue to be inspired by the life and works of Brother Bankie F Bankie!! Thank you for this update. I/we welcome any other public information on our dear brother. I am really devastated by this horrible news. You know Professor, the late Bankie was a true friend of mine for long time in South Sudan, Kenya and South Africa. We were particularly close to one another when I was editing our book The Post-Referendum Sudan: National and Regional Questions in which he has a chapter. He was such a wonderful contributor and discussant. Inform members of his family and friends that I wish them courage after the demise of a true Pan-Africanist. I pray the Almighty God to rest his soul in eternal peace. I’m grateful for your email, even though it’s painful reading the details of our brother’s passing. Like you, he remained a generous mentor to the end. As you know, I placed great value on our exchange of information and ideas, and relied on you both for insights and history deeper than my own. Br. Bankie wrote me on June 4, 5, twice on the 7th and again on June 10th. After that, I could get no response to my emails and assumed that he had traveled. By July I was sufficiently disturbed to reach out to Cecil in London. However, I took comfort that he had no news of illness. Now I will be frank. In my view, Br. Bankie had a mix of integrity and willingness to sacrifice that were uniquely his. We shared confidences for which I will be always grateful. I’m hoping that you will not consider me importunate in asking you to fill the precious space he did in my growth. I would also like to write Rita, who I met when I was in Namibia and require a current address. May our dear brother’s presence continue to comfort and inspire us all! On behalf of the NIC of Cabo Verde, we express our deepest condolences to brother Bankie’s family and friends! Our only tribute for him, as now an honorable ancestor, is continue the peoples unification of Africa, with the United African State, in less than a generation! Thus, I agree with brothers Felipe, RasTehuti andDr. Vince! I hope that this communication reaches you and family in good health. We argue about means, methods, when the we stop andconsider the issues we find that we are left with the same ‘vexing questions’ what must be done’ it is also true that we cannot andmust not allow so called other races (where they gonna run to?) are advancing technology whilst we seem to be users… what must be known here is all technology comes from InI created by our ancient Ankhcestors thousands of years ago, whilst these other’ races’ lived as primates or in caves. You always advance a loving and clear revolutionary Pan African analysis Bro.Vince. Greetings Brother Mwalimu, Thank you. Your response received with respect and humility. A warrior has left us. Let us double our efforts in moving on up, and so, when our time comes to walk our natural paths, we will have left less work for others to do. WE really have no true and dignify alternative to our Unity in Diversity. Destructive In-fighting among us are old-fashioned and probably primitive (backward looking). Collective debates among us to find balanced solution is acceptable as that has purpose and expectations. But when the only outcome to our debate is futile spilling of our blood on the dry ground, and so making openings for traditional and international thieves to come among us, to complete our destructions, our folly borders on true treachery to ourselves and our unborn. Our tribes exist and are important. If our current tribal status and importance are hindering our collective progressive actions, make tribes of secondary importance and Our Collective primary importance. No single tribe will save us. It will not save itself. It did not do so in the past. The little bit of independence Global Afrika has today was not won by any individual tribe. It was won through collective Pan-Afrikan, Civil and Human Rights actions. Those Afrikans who were kidnapped and taken to foreign lands, particularly those on the plantations in the Americas, forced liberation from their physical chains, including Haiti, through COLLECTIVE ACTIONS. The vast majority could not read or write any language whatsoever; yet they overcame. They had no problem with their individual personalities, and if they did, that was no impediment to their struggles for freedom. Their focus was FREEDOM. Today, our focus is UNITY. WE must do what WE need to do. They say that necessity is the mother of invention. The record suggests that some members of the Pan African Federalist Movement are making sacrifices in a variety of ways. WE have also read reports of young activists losing their lives as they pushed forward for the realisation of Afrikan Unity, not only on the Continent of Africa, but also Global Afrika. WE have entered an active and evolving Space Era. My concern is that other Races appear to be taking the lead in so many areas, which are having fundamental impact on Humanity. I reject the suggested notion that Global Afrika is destined to play catch up to other Races. We must begin to embrace self-sacrifices as a way of life, in order to achieve our Collective Objectives, and we should not expect any praise for that. In fact, we should also encourage members of our communities and friends to do more positive actions in the backgrounds and allow the results shone by its self. WE are racing against time. WE MUST REACH A POINT OF CRITICAL MINIMUM UNITY, AT THE EARLIEST, IN ORDER TO BE ABLE TO NAVIGATE OUR COLLECTIVE AFRIKAN DESTINY, BY OURSELVES AND NOT BY OTHERS. Brother Bankie knew this, and no doubt, it drove him forcefully forward. Better will only come for us collectively, when we manufactured it for ourselves. Grow in health and prosper, family. Please allow me to associate myself with your quite eloquent sentiments. Brother Bankie was a dedicated Pan Africanist and a good friend. He will be solely missed. It is with deep sadness we received the content of your e-mail. Our condolences to Brother Bankies family. Bankie F. Bankie had been a friend and colleague of myself and our Organisation. Our regular e-mail communications, telephone conversation and meeting with him in London recently, in addition to our receiving regular research dispatches from his work as the Founding Director of the Pan-African Institute for the Study of African Society (PAISAS), based in Windhoek, Namibia, since 2015. These gave no indication that he was ill.
Our work with Bankie was an inspiration. His focus, sincerity, generocity and deep commitment to Our Afrikan Cause were undeniable. His work in South Sudan is legendary. May his Essence rest in peace and may the Ancestors receive him with delight and satisfaction, in that Brother Bankie had done his work well. And we hope that his re-placement is already working with us, taking the Pan Afrikan baton faster and farther, as we journey collectively to the final stage of that Journey Afrikan Unity in Diversity, thus ensuring that Bankie F. Bankie and other nameless ones, who gone on to Our Ancestors before us, had not worked in vain. Thank you Bankie for shouldering part of our load while you were with us in person. What is certain, if we were born, we will die. What makes the difference is our positive contributions to the service of Humanity, while we live. The evidence is clear; your contributions add to the legacy of Our Afrikan Inheritance. Until we meet again, travel well. I wonder whether you still remember me, after such a long time after we met at UNISA, during the November 2009 Sudan Studies Conference? 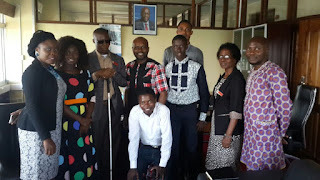 I have just suggested on WhatsApp to, amongst others, look into the initiative of a Pan-African Leadership Development Institute in Juba, once discussed with Dr John Gai N Yoh, Minister P. AdwokNyaba, Prof. S Gutto and others. I don’t even know whether the Institute was eventually established; but I think that it would be great to create it and name it after Brother Bankie. What do you think? If you agree with the idea, you then could, perhaps, look into that? Thank You Brother Faye, and all. 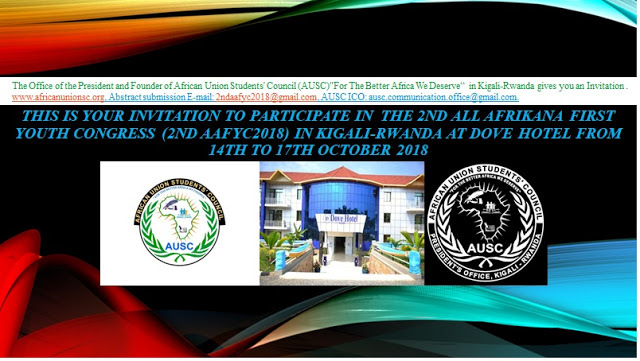 Receive as well your invitation to participate and speak in the 1st All Afrikana First Youth Congress in Kigali-Rwanda, October 15th to 18th , 2017. AUSC President’s Office in Kigali-Rwanda recalls Save the Date: African Diaspora Investment Symposium 2018,August 16th , 2017. Please read on our brother Bankie. Still deeply hurt he passed away, there was a lot he would have contributed. Galant, fearless and dedicated fighter for the noble ideals of Panafricanism has fallen. Bankie will remain with us in the struggle for independence. Unity and prosperity of our beloved Continent! I am so sorry to learn of Bankie’s death. I am especially sad that he seemed to be alone when it happened. Thank you so much for letting me know. I will wait for further information. I, too, heard the awful news from Estelle. But the details you now disclose are hard to live with. Poor Bankie! At least he is getting the recognition he so richly deserves from the Namibian authorities. Please keep us posted on the funeral and other arrangements. On behalf of Sompeta Xolo’s family, we wish to extend and express our deepest condolences to Mr. F. Bankie’s family and his wife. May his soul be welcomed to the council fired of his people, because they are all there but one. That is sad news, we are going to missing him, his place is going to be empty , no one is going to fill it. Thank you for this update/overview. It is indeed disturbing. I will forward to some of the extended family members. Our hearts are with the family and the community at large for grieving brotherBankiespassing on. His loss is also a loss for the advancement of Pan African federalist movement. However, it remains our obligation to carry his aspiration for the realization of PAFM. We dare not fail him in this regard and those that have gone before him. As we have been given a task of establishing the Southern African Initiating Committee, I realize how we could have missed to include brother Bankie to be part of the committee due the fact of not knowing him and the role that he has played in the realization of PAFM. 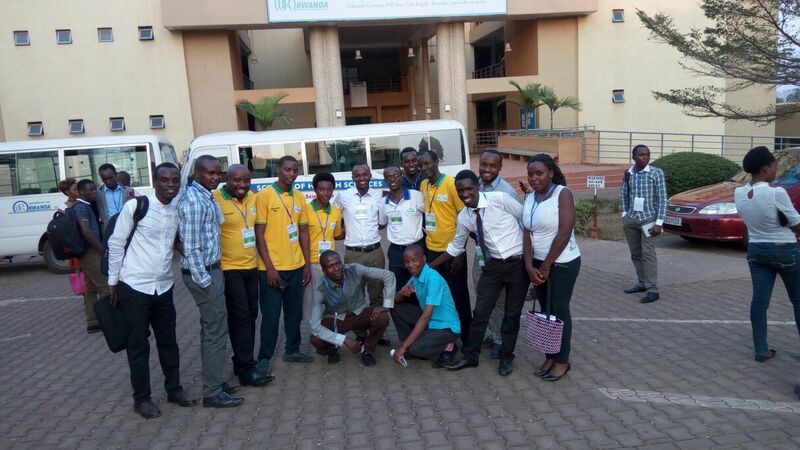 Based on the realization that we should not unintentionally exclude some notable persons that we might not be aware of their roles in PAFM, I humbly suggest to all that you forward to me individuals that you might know in the SADEC Region that are passionate about PAFM and are prepared to play their roles in the realization of the PAFM in our generation. Mes sincres condolances. Que Dieu laccueille au paradis. Amine. Que c’est trs triste! Nos vives compassions. Brother Bankie F. Bankie nous a quitt en pleine bataille… Il nous laisse un important hritage qu’il nous appartient de mettre profit; et de l haut prs de Dieu Tout Puissant, il nous regardera et sera fier de nous. Au nom du CIN/Burkina, nous souhaitons toutes et tous, proches, amis, parents et connaissances plors, beaucoup de courage et de foi. Vivement, que Allah lui accorde son pardon et le repos de l’me dans son Paradis cleste. Our sincere condolences to the family. Let his soul rest in peace.! My condolences to all whose souls were touched by Brother Bankie F. Bankie’s life and work !! All my condoleances to bankie family may his soul rest in peace. A time to mourn a real hero…We will miss you big brother Bankie. Very sad news indeed of the passing of Brother Bankie: a fearless, tireless, principled fighter of the Cause of Pan-Africanism and African Renaissance. We first got acquainted to each other when preparations for the then 7th PAC were underway: which I refused to attend given the disunity that was dislocating our ranks, with 3 different PACs at the time: one in Nigeria (with Brother NaiwuOsahon), another one in Uganda (with the late Brother Tajudeen Abdul Raheem) and another one in Senegal (with Abdoulatye Wade). Later on, we worked together with Brother Bankie, General Ishola Williams and prof. ShadrackGutto and many others, on the November 2009 Sudan Studies Conference at the University of South Africa (UNISA) which turned out to be a great success. My last physical encounters with Brother Bankie were in Namibia where he organised various speaking platforms and media interviews for me in addition to working meetings with the National Youth Council; and then, one year later, at the 8th PAC in Johannesburg, co-organised with Prof. KwesiPrah, that I attended notwithstanding disagreements about the nature of this gathering and the ways in which it was organised. Since then, after I returned to Senegal, Brother Bankie and myself have maintained contact, although not on a regular basis, about, amongst others, the First Pan-African Federalist Congress initiative. I am shocked; and very sad, deeply bereaved about Brother Bankie’s passing: a big loss for all of us. I would like to take this opportunity to present my condolence to his wife and family, including the Namibian people and its youth who had so strongly embraced him as a family member. Hambakahle, may your soul rest in everlasting peace, my dear brother, tireless soldier, dignified son of the African soil. This is very shocking and sad news. BankieBankie was a staunch and committed Pan Africanist with whom we have been in extensive dialog since the 7th Pan African Congress in Uganda in 1994. We have lost a freedom fighter who cannot be easily replaced. May his life and commitment to Africa and it’s people, at home and abroad, serve as an example and inspiration to us all. Rest in peace dear Comrade. The Caribbean RIC express our most sincere condolences having learned that the beloved Brother Bankie F. Bankie, who was a mentor, friend and colleague to many and originally from Gambia and then Namibia, has made his transition recently. Our Ankhcestors will accept him – he was a very conscious active positive and productive Pan Afrikanist. He has ran the race well and did all for Africa up to his last moment. He will be remembered.